Home→“LITTLE AWESOME ANNIE” HAS OPENING NIGHTERS ON THEIR FEET! 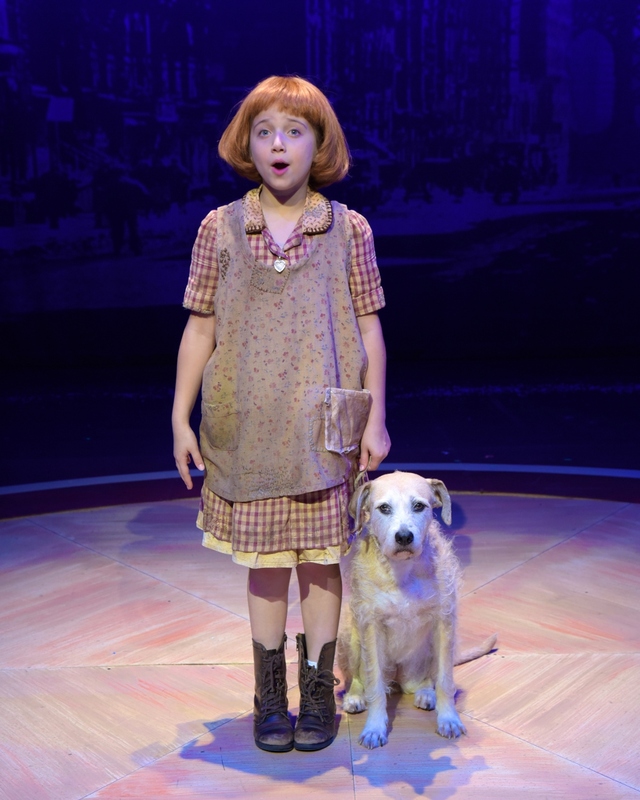 PEYTON ELLA’S “ANNIE,” BIG LITTLE VOICE OF HOPE MEANS HAPPINESS IS JUST A SHOW AWAY. 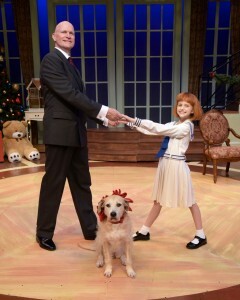 AUDACIOUS LITTLE REDHEADED GIRL MELTS MICHAEL DeVRIES’ DEBONAIR DADDY WARBUCKS INTO BILLIONAIRE WITH HEART! TURNS AROUND AN AUDIENCE AND SENDS YOU OUT WEARING A SMILE. I think Peyton Ella WBT’S Annie should visit President Trump when he gets back to the White House. If anyone can bring out the President in this President, this little dynamo can! The spunky, charmy sentimental message sweetie Peyton Ella (above) delivers to President Franklin Roosevelt (played by the cleverly Presidential John-Charles Kelly in a wheelchair) as the Little Orphan Annie looking for her parents, inspires FDR to create the “New Deal!” by singing Tomorrow to him and his whole cabinet. Peyton’s delivery of the simple power of audacious hope refocuses the President’s attention. That’s after she wins the admiration and care of the Billionaire Daddy Warbucks who encounters Annie when he decides to invite an orphan to spend two weeks in his mansion as a Christmas gesture. 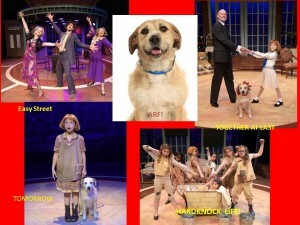 The latest revival of Annie done up in Broadway schmaltz at WBT, is choreographed and directed by the Mary Jane Houdina, assistant choreographer for the original Broadway show that opened in 1977, and who prepared the national tours of the show. And I might add, triumphs! But enough theatrical intellectualizing already. From the first strains of “Tomorrow” wailed by a clarinet right out of the 30s solid orchestral back up creates the mood throughout never overbearing on the vocalists. Right out of those first notes of mournful haunting melancholy, you’re into the show as a sleeping orphanage dormitory awakens to the sound of a crying child. Annie, the precocious Peyton Ella, leader of the group of delightful and deftly comical local young performers sings Maybe, and you’re caring. The wonderful scamps: The Orphans Tell You all about It’s a Hard Knock Life! 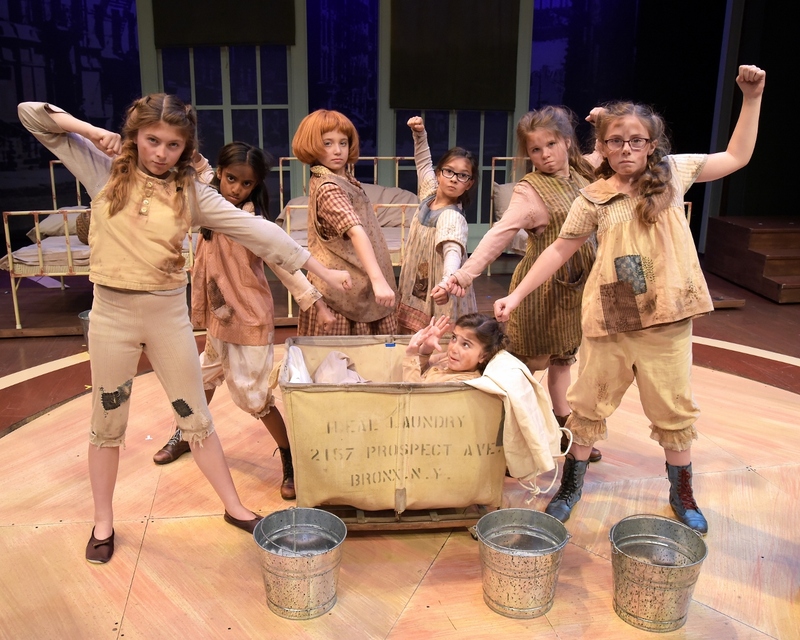 They are: (L to R:Ruby Griffin, (July), Anika Bobra (Tessie), Peyton Ella (Annie), Gabriella Uhl (Iate), Nora Kennedy(Pepper), Maureen Henshaw (Duffy). In Basket: Haylie Shea Christiano (Molly). The orphans are great comics and singers, especially Molly Lyons, only 8 who consistently sneaks a stomp on Ms. Hannigan’s foot when she isn’t looking. The meanie orphanage manager, Miss Hannigan is played with over-the-top cackling witchiness by Susan Fields who makes the former Carol Burnett role her own, with her own style and timing. Ms. Fields mincing, snarling indictment of Little Girls is a hoot. I really like the veteran actor, Michael DeVries’ Daddy Warbucks. He has the command and the intensity of a character out of Atlas Shrugged by Ayn Rand— the tycoonHank Riordan. Meeting Annie in his mansion, a mansion interior atmospherically created, (it looks rich without marble) by the set design magicians, Michael Bottari and Ronald Case—he puts aside his dictation and takes Annie to the movies. Strolling down 5th Avenue, he delivers NYC, while Annie and he and his secretary, Grace (the impeccably efficient and savvy Celeste Hudson) to the left) stroll down 5th Avenue to the Roxy, with the buildings passing by in the background. NYC was delivered with reverence and Sinatra-style by Mr. DeVries creating the inspiration that the city does in real life. 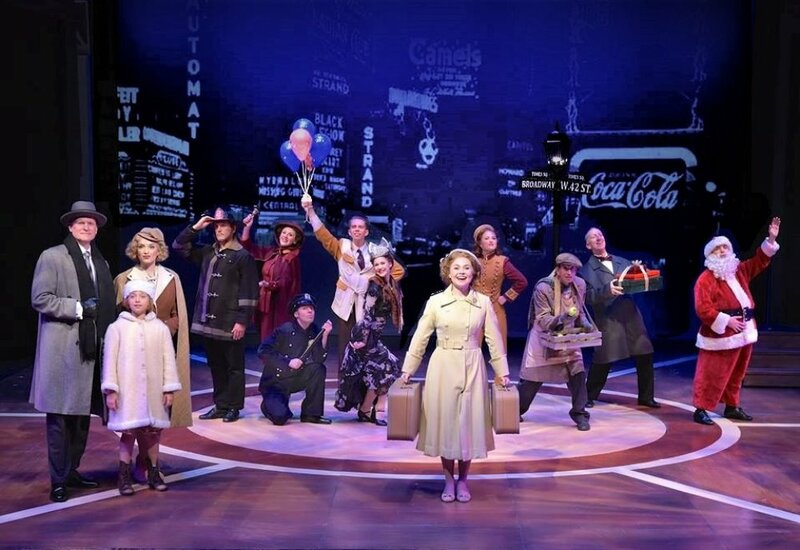 You will love the moving night scene in Times Square—kudos for that staging to Bottari and Case and Little Ms. Ella, Mr. DeVries and Jesse Lynn Harte (A Star to Be ) for this showstopper strut. It’s the stuff New York dreams are made of. The only star I have heard do NYC AND REALLY SELL IT is Sutton Foster in her nightclub act and DeVries joins her in delivering this song in perfect NYC “New Yorker” style. The villains of the piece Rooster, Ms. Hannigan’s brother and his Jersey City girl friend visit the orphanage just as Annie is returned to the orphanage after running away. They lament about Ms. Hannigan’s mother who advised them all to be a little shady to make it to Easy Street (Above)(where the rich folks play). Ms. Fletcher, the zany Rooster Adam Roberts and Aubrey Sinn as Roosters girl just prance to this song everyone loves. Yes, Sandy’s back, too! There is a Sandy who steals the show from the first time Annie meets him. The audience goes “Awww,” and the children love this. (So do the adults!) In fact, this is a great show for children (of all ages, thank you P.T. Barnum). Scarcely any violence. And you do not have to explain too much. This is a show where the kids win! Kids love it when kids win! 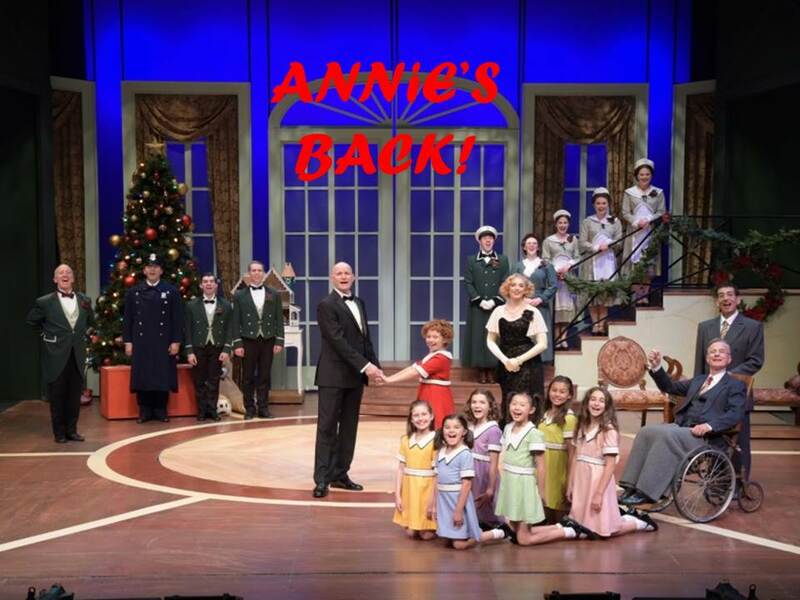 Annie settles in at the Warbucks mansion and when Warbucks wants to adopt her she says she hopes to find her real parents. 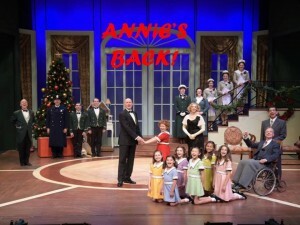 Daddy Warbucks, hurt, because he has grown to care deeply for Annie, vows to help her find her parents. He brings the FBI in. He calls a meeting with President Roosevelt with Annie present. Act Two opens with a marvelous send up of oldtime radio, the Burt Healy Oxidant Hour of Smiles. The Boylan Sisters sing You’re Never Fully Dressed Without a Smile. 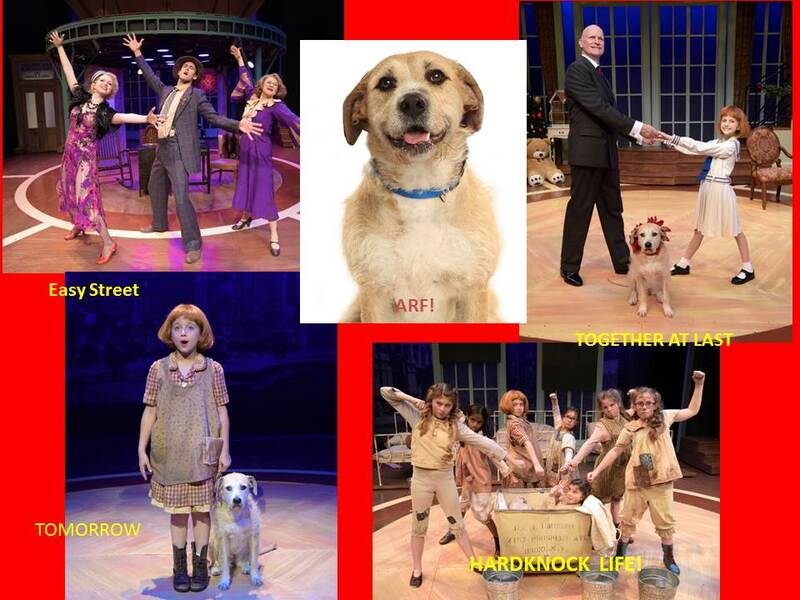 Warbucks delivers a message about how Annie is searching for her parents. 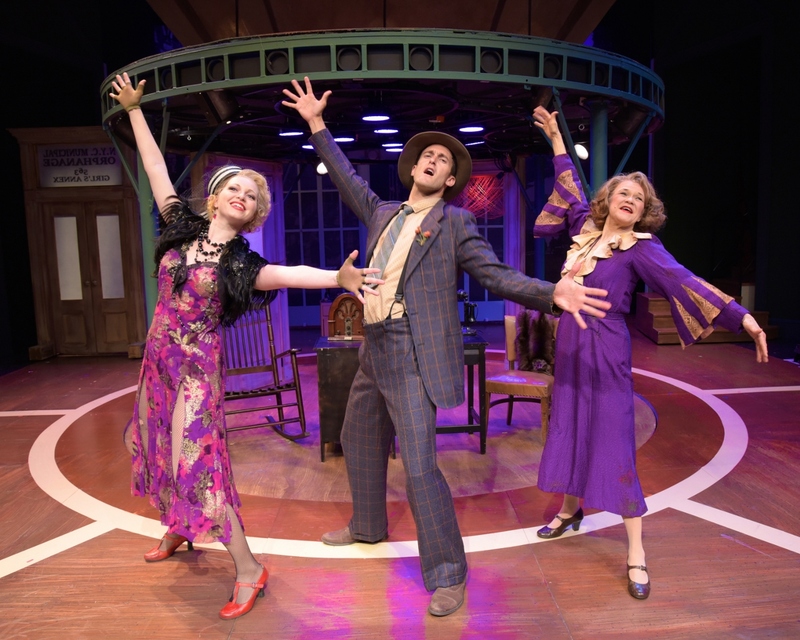 Rooster, his girl friend, and Hannigan cook up a plot to acquire the $50,000 reward, based on secret knowledge with the conniving, scheming Miss Hannigan. But the FBI, which is apparently much better in the 1930s than it is today, uncovers some information that might just bust up the plot. Peyton Ella as Annie really shines in the duet, I Don’t Need Anything But You, and DeVries does a refreshing and sincere delivery of Something Was Missing. That song is the way every father feels about a daughter or a son, or should, and Mr. DeVries just handles it with elegance and elegy. ANNIE with the dynamic little Miss Peyton Ella as Annie and Kaylin Hedges as Annie on Sundays plays from now until September 10. 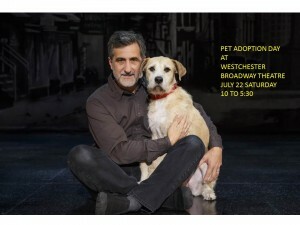 For box office information, call 914-592-2268, or visit the website www.BroadwayTheatre.com. I have seen this show many times, in the movies, in performance, but it never fails to deliver a lift to the heart an easing of the mind, and a new resolve to do better, be tougher and do what must be done. The songs Tomorrow, You’re Never Completely Dressed Without a Smile, they ring true, my friends. You’re never too old or too cynical not to be moved by Annie. It’s playing tonight! You’ll put on a new smile tomorrow! Oh Sunny the dog wants me to remind you– Annie will host a Pet Adoption Day Saturday, July 22, 10:30 AM to 4:30 PM with organizations offering dogs and cats for adoption. You do not have to buy a ticket to the show to participate in the Pet Adoption Day.